Marjorie P. crocheted this beautiful afghan for her granddaugther who likes to rodeo. 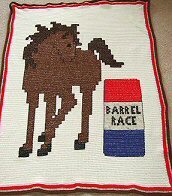 She used our cross stitch September Horse pattern to stitch the pattern on top of her single crocheted afghan. She changed the apple barrel into a rodeo style barrel. This beautiful afghan was stitched by Jan from Wyoming. 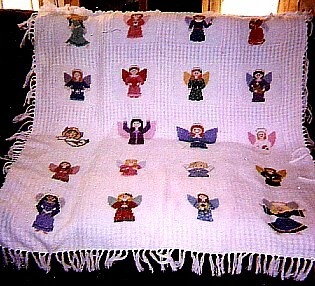 She used the Angels of the Month and the Fruits of the Holy Spirit Angels for her project which was a gift for her granddaughter. 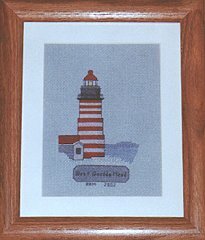 which has twenty 14-count 6-1/2" blocks to stitch your individual patterns. 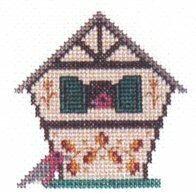 Lyne-Elizabeth stitched this October Birdhouse as a model to teach a cross stitch class at her local Michael's Arts and Craft Store. 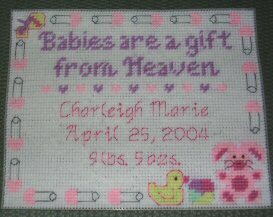 Charlotte stitched this Plastic Canvas Baby Birth Sampler to commemorate her granddaughter, Charleigh's birth. 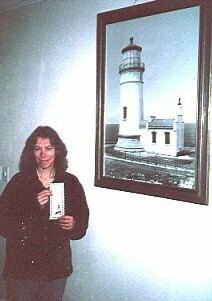 Anita stitched this West Quoddy Lighthouse as a gift for her friend who enjoys visiting lighthouses in New England. 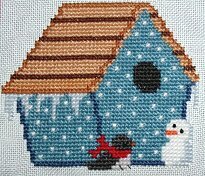 Sara S. stitched this January Birdhouse on 28-count light blue linen for her round robin. 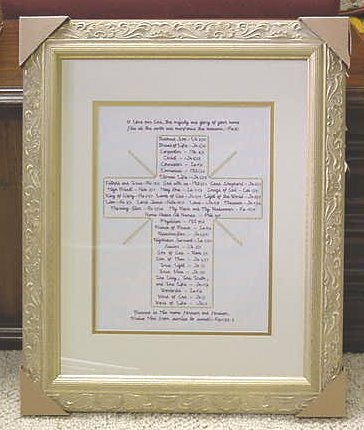 Melissa L. stitched this "Names of Jesus" Cross and had it beautifully framed as a gift for a friend. 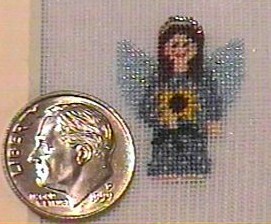 For more delicate projects suitable for brooches and other jewelry, you might want to stitch an angel on 40-Count Silk Gauze, like the August Angel, here. 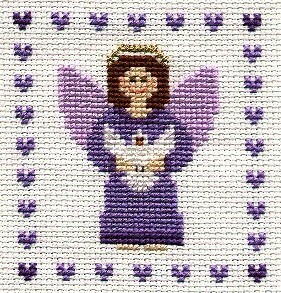 Click here for this FREE August Angel pattern.